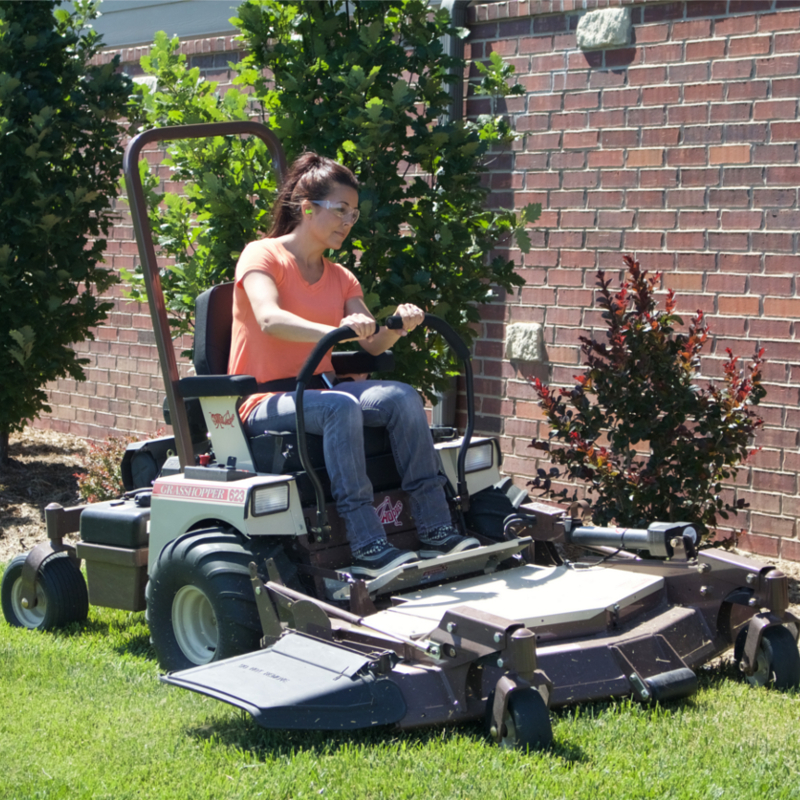 An ideal FrontMount™ solution for home or business use, the Grasshopper Model 623T riding lawn mower with zero-turn maneuverability offers the power, reliability and economical performance that homeowners and lawn care professionals need to get the job done. Make quick work of cleaning the underside of the cutting deck with the exclusive PowerFold® deck lift/electric height adjustment feature. 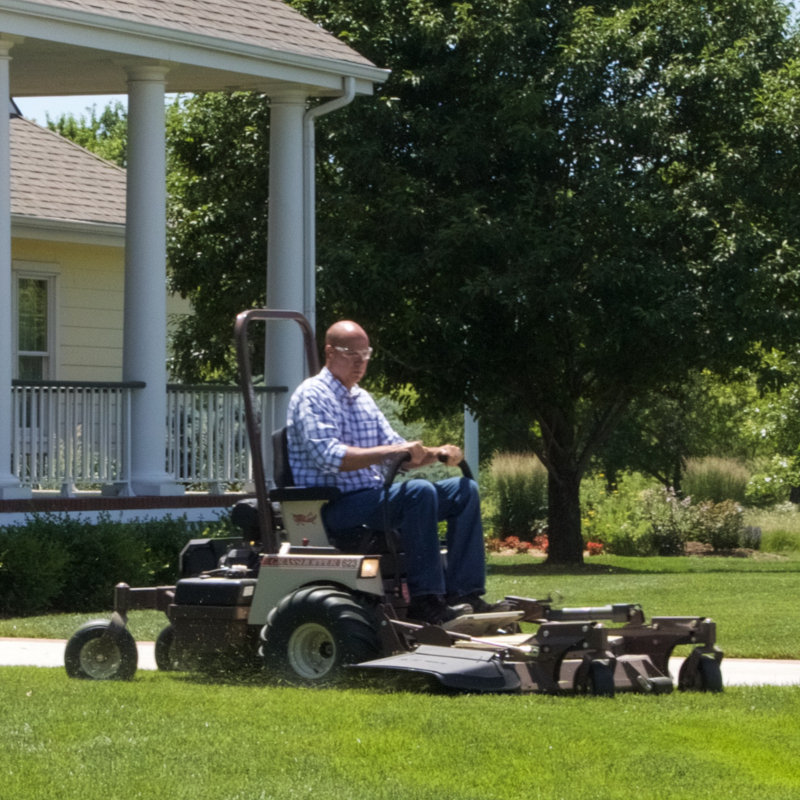 The front-mounted deck removes and can be replaced with turf renovation and snow removal implements for year-round productivity. 694 cc, 2-cylinder, air-cooled Kohler Command PRO V-Twin engine. 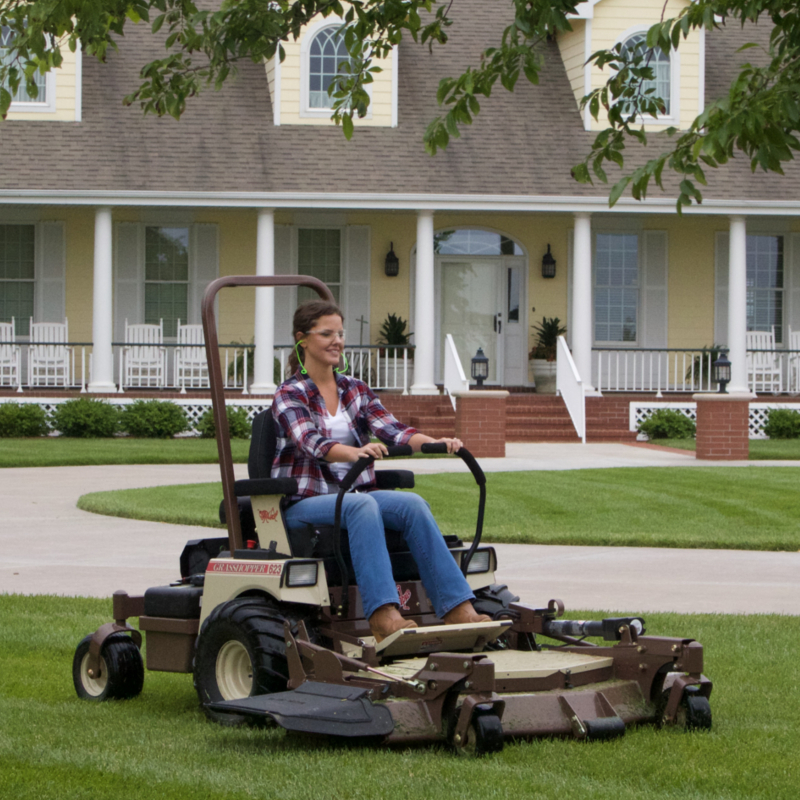 48-inch 33 Series out-front, side-discharge deck, which easily converts to Down Discharge® mulching or vacuum collection. Available as manual FoldUp™ deck or equipped with PowerFold® electric deck lift/height adjustment. 52-inch 34 Series DuraMax® side-discharge deck, which easily converts to Down Discharge® mulching or vacuum collection. Available as manual FoldUp™ deck or equipped with PowerFold® electric deck lift/height adjustment.52-inch 34R Series DuraMax® side-discharge deck, which easily converts to Down Discharge® mulching, rear discharge or vacuum collection. 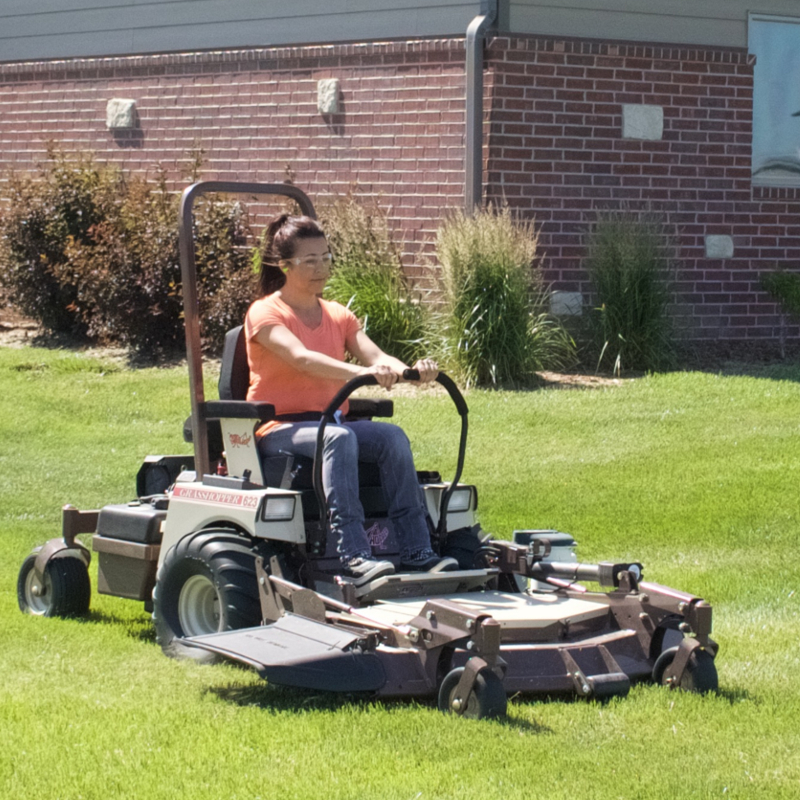 Comes standard with PowerFold® electric deck lift/height adjustment. Deck Construction Tubular 2.25 in. x 4 in. boxed members with 0.25 in. gussets. Formed double thickness hardened steel (0.239 in. = 3 gauge (6.07mm)) truss spindle plane and (3) Sentry™ spindles and a triple-strength upper deck, over 1/2 inch thick in stress zones. 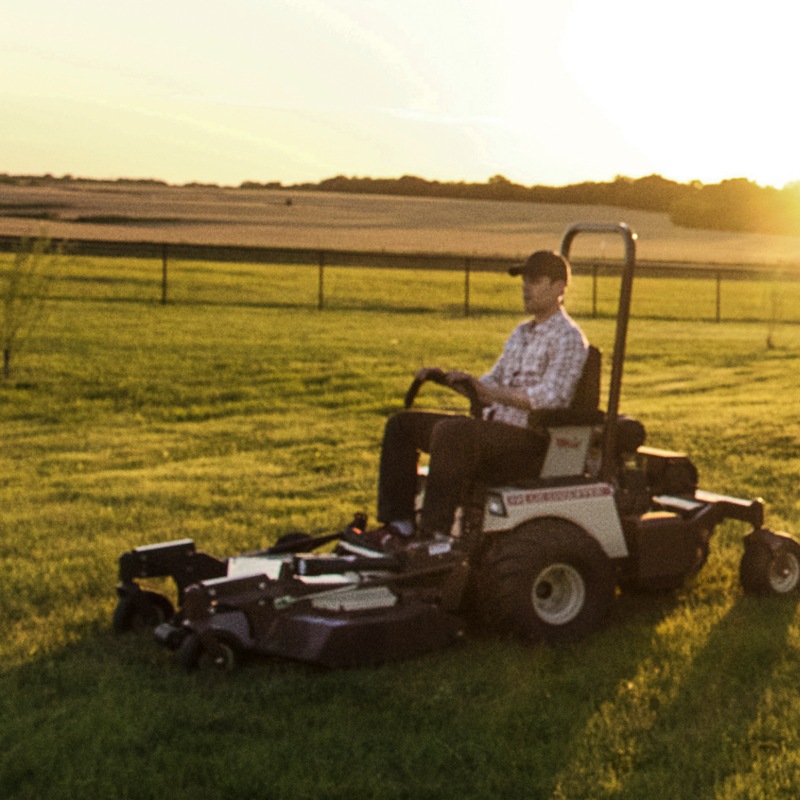 Geometrically engineered design with 7-gauge skirts withstands the brunt of commercial mowing. Anvil-edge design with o.5 in. (12.7 mm) reinforcement on front edge of deck. Tubular 2.25 in. x 4 in. boxed members with 0.25 in. gussets. Formed double thickness hardened steel (0.269 in. †7.6% thicker than 0.25 in. (6.35 mm)) truss spindle plane and (3) Sentry™ spindles and a triple-strength upper deck, 1/2 inch thick in stress zones. 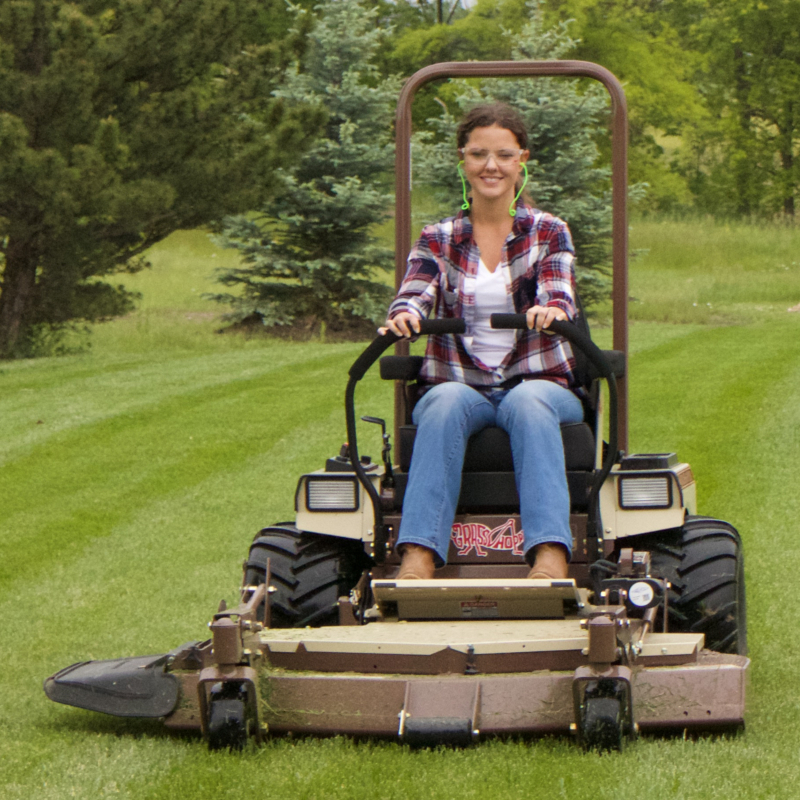 Geometrically engineered design with 7-gauge skirts withstands the brunt of commercial mowing. Anvil-edge design with o.5 in. (12.7 mm) reinforcement on front edge of deck. Blade Drive Maintenance-free gearbox with single Kevlar V-belt and idler arm tensioning. Maintenance-free gearbox with single Kevlar V-belt and idler arm tensioning. Operator Seat Ultimate Suspension Ride (USR) iso-mounted, high-back, deep-cushioned, foam-padded CoolTemp Cordura-covered, padded arms/backrest with lumbar support and coil-spring suspension. Optional CoolTemp Cordura-covered premier suspension seat. Ultimate Suspension Ride (USR) iso-mounted, high-back, deep-cushioned, foam-padded CoolTemp Cordura-covered, padded arms/backrest with lumbar support and coil-spring suspension. Optional CoolTemp Cordura-covered premier suspension seat. Console-mounted Instruments Low engine oil pressure and parking brake indicator lights, work lights, digital hour meter, ignition and push/pull PTO switches. Choke integrated with throttle lever. Low engine oil pressure and parking brake indicator lights, work lights, digital hour meter, ignition and push/pull PTO switches. Choke integrated with throttle lever. Transmission Type T-Drive™ hydrostatic transmission with tandem 12 cc Parker pumps-in-reservoir, in-line CoolFan™ for cooling efficiency, design-matched Parker high-torque wheel motors. AntiVibe Power Platform® reduces vibration for the operator. T-Drive™ hydrostatic transmission with tandem 12 cc Parker pumps-in-reservoir, in-line CoolFan™ for cooling efficiency, design-matched Parker high-torque wheel motors. AntiVibe Power Platform® reduces vibration for the operator. Transmission Filtration Integrated, replaceable, high-efficiency, fine-particle filter / Grasshopper CoolTemp Hydro-Max™ fluid withstands high and low temperature extremes for 1,000 hour change intervals. Integrated, replaceable, high-efficiency, fine-particle filter / Grasshopper CoolTemp Hydro-Max™ fluid withstands high and low temperature extremes for 1,000 hour change intervals. Speeds 0-8.5 mph (0-13.7 kph) forward; 0-5.5 mph (0-8.9 kph) reverse. 0-8.5 mph (0-13.7 kph) forward; 0-5.5 mph (0-8.9 kph) reverse. Turning Radius True zero degree, turns within own length with counter-rotating, independently powered drive wheels. Seat is pivot point. True zero degree, turns within own length with counter-rotating, independently powered drive wheels. Seat is pivot point. Steering One- or two-hand operation with adjustable, HydraSmooth™, dual levers that automatically return to neutral from either forward or reverse position. One- or two-hand operation with adjustable, HydraSmooth™, dual levers that automatically return to neutral from either forward or reverse position. Attachment Drive Telescoping PTO shaft with two high-speed U-joints, Quik-D-Tatch® coupler and heavy-duty electric Mag Stop® blade clutch/brake. Telescoping PTO shaft with two high-speed U-joints, Quik-D-Tatch® coupler and heavy-duty electric Mag Stop® blade clutch/brake.